The granddaughter of William Shakespeare, Lady Elizabeth Bernard, once lived in what is now Abington Park Museum, Northampton, is buried in the adjacent Church and 2016 happens to be the 400th anniversary of the Bard's death. 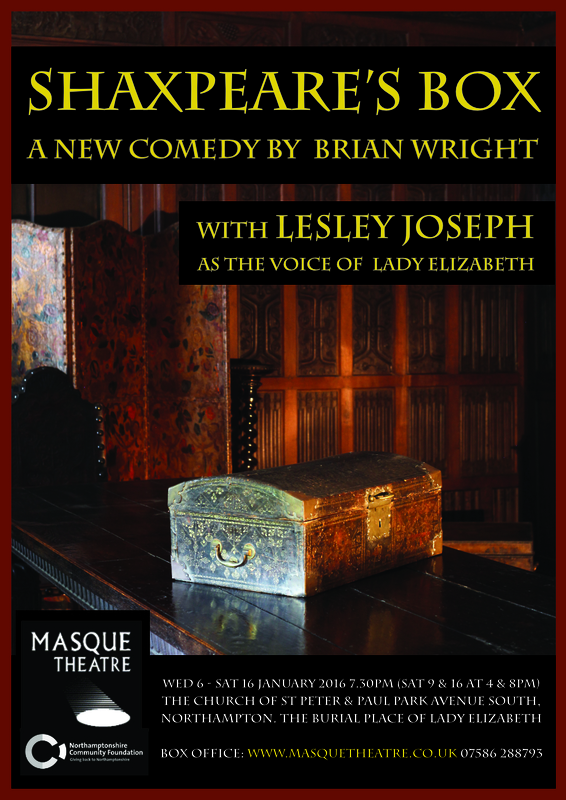 These basic facts form the background to the Masque's production of Shaxpeare's Box, a new comedy specially written and directed by Brian Wright and performed in Abington Church itself. The play is set in the present day and is built around the discovery of an ancient and mysterious locked box, apparently decorated with the Shakespeare family crest, in the museum attic, causing much excitement amongst those involved, including archaeologists, a Shakespeare-loving curate, administrators, and local councillors, some of whom recognise the discovery as a great opportunity to cash in for themselves. On the ‘goodies’ side, as this amusing and entertaining plot develops, is Holly Lowe, as a museum employee, giving an excellent performance, and her first role for Masque, in a technically demanding part, especially when conversing with the disembodied, pre-recorded voice of popular actress and Masque president Lesley Joseph as the ghostly Lady Elizabeth. Mark Farey as the sympathetic Curate is warm and funny, ably demonstrating his Shakespearean credentials when quoting from the Bard's works. Masque stalwart Owen Warr is well cast as a well-intentioned councillor, a role which Owen obviously relished, while April Pardoe, playing an administrator under pressure from the ‘baddies’ is very affecting and has no problem gaining the audience’s sympathy for her predicament. On the night I attended, the prompt, Rosie Chapman, had been drafted in to a performing role due to the original actor’s illness and did so well that we were not really aware she had access to a script. A sparkling new comedy, to mark the 400th anniversary of Shakespeare’s death and his unique connection to Northampton through his granddaughter and heir Lady Elizabeth Bernard. 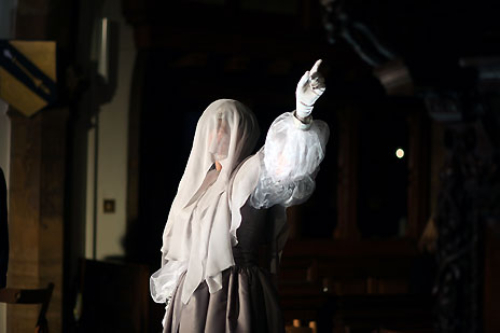 She lies buried in the church where the performances take place, next to Abington Museum, her former home. Northampton-born TV star Lesley Joseph heads the cast as the Voice of Elizabeth’s Ghost. Music is composed and performed by Richard and Elizabeth York. The play is written and directed by Brian Wright (BAFTA nomination, double Sony award, former member of the Royal Shakespeare Company and BBC producer). The production has been awarded a Northamptonshire Community Foundation grant. The story is set in Northampton now, and tells what happens when everyone’s dream – finding a priceless heirloom in the attic – turns into a comic nightmare. Will the Ghost help uncover the mystery of what was left in her attic…? Come and enjoy our ‘winter’s tale’, chase away those post-Christmas blues! The church is warm and refreshments will be served, but bring a cushion if you like, as the seating is on church pews. Abington Museum is open before the matinee performance on Saturday afternoons. Brian Wright has lived in Northampton for the past 25 years, originally from East Ham, educated there, Oxford and RADA. Worked as an actor in repertory, RSC, West End, T.V. and radio; as script-editor and producer at BBC; as playwright for BBC, ITV and various theatres; published children’s novel for Heinemann, story collection for Souvenir, two audio-books for Crimson Cats; two Sony Awards, BAFTA and Writers’ Guild nominations; Fellow in Playwriting Bristol University. Agents: Sheil Land Associates (Philippa Sitters).